NEW DELHI (Reuters) - U.S. National Security Adviser John Bolton spoke to his Indian counterpart promising support to bring those responsible for a deadly car bombing in disputed Kashmir to justice, the Indian Foreign Ministry said on Saturday. 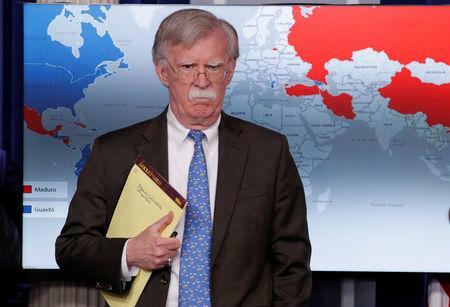 Bolton told Ajit Doval in a telephone conversation that the United States supported India's right to self-defense against cross-border terrorism, the Indian Foreign Ministry said in a statement. "The two NSAs vowed to work together to ensure that Pakistan cease to be a safe haven for JeM and terrorist groups that target India, the U.S. and others in the region," the ministry said. "They resolved to hold Pakistan to account for its obligations under U.N. resolutions."